Logistics doesn't exactly get a bad rap, but you won’t hear it discussed often at parties. In its broadest sense, the term means “the handling of the details of an operation.” Once applied specifically to the military, it has come to be most associated with transport: imports and exports, switchyards, trucks and trains, last-mile connections, inventory and supply coordination, truckers and loading docks – all the components of moving goods from one place to another. Frankly, to a supplier, logistics can represent headaches, especially as the rise in online or “omni-channel” commerce makes it more challenging than ever to meet consumer needs. The revolution in supply and demand represents vast opportunities, and in Georgia, the logistics industry – which already represents more than $15 billion annually and a million-plus jobs, according to GDEcD figures from 2009 – could snowball into one of the state’s biggest employers. On March 19-20, the Center of Innovation for Logistics will hold its fifth annual Georgia Logistics Summit at the Georgia World Congress Center in Atlanta. (Georgia Trend is a media partner.) Last year’s event drew 1,600 attendees, and this year looks to be even bigger. Companies like The Home Depot, Carter’s Inc. and UPS will sit down with the Georgia Motor Trucking Association, Georgia Ports Authority and others to celebrate, commiserate and strategize. Amazon now has a new category on its site called “Endless Inventory.” The Internet giant and other companies want to make sure that if a product isn’t available on the shelf or in the warehouse, they can get it from another part of the world. Of course there is no “endless inventory” – but companies move as much as they can. Locally, Holifield says The Home Depot plans a new $50-million direct fulfillment center in Mc-Donough to support online business, spanning more than a million square feet and employing more than 300. In October, The Home Depot opened a customer contact center in Kennesaw, which will eventually create 700 jobs. Carter’s, Inc., the apparel manufacturer, is paying more attention to online operations as well. “Due to the strength of consumer demand online, we’ve had to accelerate our plans to insource our e-commerce fulfillment capabilities to a multichannel distribution center, which we believe will improve customer service levels and reduce costs,” says Greg Foglesong, senior vice president, marketing and e-commerce. Serving companies like The Home Depot are a cluster of 11,000-plus logistics companies in Georgia. Manhattan Associates, which facilitates company-consumer transactions, has been in the business since 1979, when it started in California. In 1995, the company moved its headquarters to Atlanta, where it employs 1,000, and has since expanded to 2,500 employees worldwide. Senior Vice President and Chief Marketing Officer Jonathan Colehower says omni-channel is fueling continued double-digit growth. Omni-channel challenges also exist on the inventory end. Numerex, which has been in Atlanta since 1996, specializes in machine-to-machine (M2M) communications and is in the midst of double-digit growth due to demand for its inventory-monitoring software. Siplon was appointed by Acting U.S. Secretary of Com-merce Rebecca M. Blank to the newly formed U.S. Advisory Committee on Supply Chain Competitiveness. One of its duties is to promote and im-plement the National Export Initiative, which aims to double exports by the end of 2014. Funding for the state’s transportation network is still an issue, as only three of Georgia’s 12 regions passed the transportation sales tax, or T-SPLOST, last year. The failure of the tax cost those nine regions some $15 billion in transportation funding, but the T-SPLOST isn’t dead, says Siplon. Regions can consider another T-SPLOST in 2014 or later, according to state law. But that will take a unified political front, Metro Atlanta Chamber President Sam Williams told a panel at the Georgia Chamber of Commerce State of the Ports luncheon several months after the Atlanta region rejected the tax. There’s an even bigger problem looming: By 2016, the U.S. will need a million more logistics workers but will be 800,000 short, according to the U.S. Department of Labor. In Georgia, where logistics growth is expected to outpace the national average by five percent and triple the southeast average, the gears could be grinding. Half of that demand consists of warehouse/distribution, industrial engineers, logistics and transportation managers and freight rail and air cargo agents. The other half are drivers. Who will be the truckers of the future? “Maybe the biggest issue for the next 10 years,” adds A.D. Frazier, Georgia Oak Partners president. If Frazier’s name sounds familiar, that’s because he has been an active force in the business community for decades. He was second in command for the Atlanta Committee for the Olympic Games and has served as CEO for Invesco, Inc., Danka Business Systems and the Chicago Stock Exchange. He formed Georgia Oak Partners in 2010 with Lonergan, who previously worked with Florida investment firm Sun Capital Partners. Georgia Oak plans to invest heavily in logistics companies and recently partnered with TeamOne Logistics, which provides driver-related human resources capability as well as staffing and training for companies. 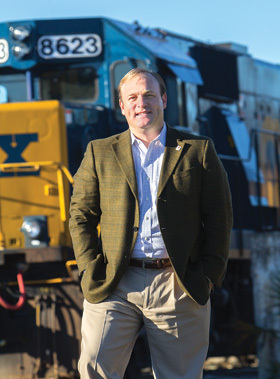 “No doubt ports will continue to be leading the flow of freight on the southeast coast,” says Frazier, “and that will grow the need to haul goods away. Since what we now take for granted is that we started as a transportation hub, we are disappointed the T-SPLOST failed. But we’re focusing instead on workforce needs,” says Frazier. The state needs to create more training centers for truck drivers such as those at Sandersville Technical College and Oconee Fall Line Technical College, says Frazier. But there is also the need for trucking firms to integrate technology, says Siplon. Georgia leaders seem to like the big-box meets mom-and-pop format. “The Georgia Logistics Summit brings together representatives from many sectors of our industry to both raise awareness about the importance of transportation and logistics to the economy of our state and address challenges and opportunities moving forward,” said Curtis Foltz, executive director of the Georgia Ports Authority. “We’ve devoted breakout sessions to food, retail and manufacturing,” says Siplon. “We picked three large buckets, because they are the big freight generators, and they all sort of fit together. We let companies tell us their challenges. Those challenges affect everyone in the community, even if ocean freight plays the dominant role. As always, underlying the summit’s focus on networking is the broad educational platform: the need for more funding – whether on the state or federal level, for deepening the Savannah Harbor, training truckers of the future and improving Georgia’s roads and railroads for handling the new traffic. It’s a tall order.